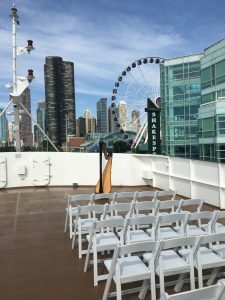 Is there a better backdrop for a wedding ceremony than the Chicago skyline? Hard to think of one! And no better vantage point than at Navy Pier, on the Odyssey Lake Michigan yacht. Amelia and Cornell were married on the Sunday morning of Labor Day weekend. Early enough to avoid the crowds of tourists that would flock to the area later in the day! 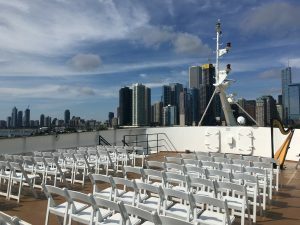 Their ceremony took place on the open-air top deck while the ship was docked, with the reception following below during the Lake Michigan cruise. As the wedding party walked down the aisle, I played “Perfect” by Ed Sheeran. Amelia chose Pachelbel’s “Canon in D” for her processional. During the unity sand ceremony, I played “Prelude in C” by Bach, and the recessional was “At Last” by Etta James. 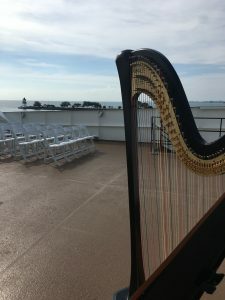 I play the harp for weddings throughout the Chicago area, on yachts and in gardens, ballrooms, churches, private homes, and other unique venues. The music of the harp is an elegant addition to any wedding! Visit my website and contact me to learn more about having a harpist for your event: Chicago Wedding Harpist. 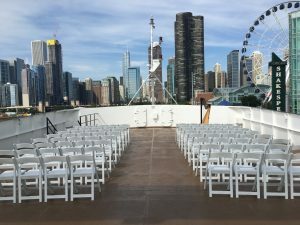 This entry was posted in Outdoor Wedding Ceremonies, Weddings and tagged ceremony, chicago, northern illinois, odyssey cruise, penti, wedding. Bookmark the permalink.